The Cedar Roof Company is the only company to trust with the cleaning and treatment of your roof, whether you’re thinking of preserving your wood roof for the first time or planning on Re-Coating your roof. Learn more about re-coat. Protect your investment, consider preserving your cedar roof. Through the interaction of ultraviolet rays and moisture, cedar shakes and shingles can lose virtually all of their natural preservatives in as little as five years. At this age (depending on the quality of wood installed) most unprotected cedar roofs show early signs of cedar shake and shingle exposure damage including cupping, curling, splitting and checking. At this same time (five years) in northern sections of roof or where trees are present topical mold or mildew can often be seen. As the roof continues to age (if not protected) the damage to the cedar shakes and shingles accelerate effecting both the roofs aesthetic beauty and its life expectancy. Since 1993, The Cedar Roof Company and our treatment process designed for cedar roofs have proven to save our customers in both avoidable repairs and premature roof replacement. Homeowners who choose to preserve their roof keep their roof. Preservation holds benefits for those with new cedar roofs as well as those with older wood roofs. Your cedar roof may benefit from preservation. For best aesthetics and performance, owners of new cedar roofs should allow them to weather a minimum of 12 to 18 month before treatment. By choosing to preserve early in the life of their roof, our installation customers add five years to their No-Leak Warranty. Many older cedar roofs, though, still have years of useful life. Not all sections of a cedar roof weather at the same rate. There are many contributing factors that dictate the available options. Every cedar roof, like every home, is unique and should be evaluated as such. Either way, the sooner preservation begins in the life of your wood roof the longer you can expect it to last. 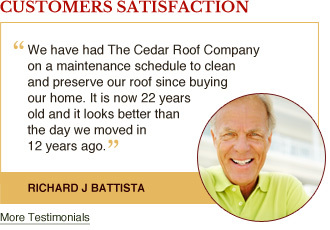 Properly installed and maintained, a cedar roof can last 50 years and longer. 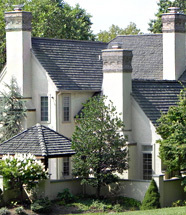 Our goal is to educate homeowners about the proper care and maintenance a wood roof requires. Preserving your cedar roof will significantly impede the damage caused by sunlight and moisture. The preservation coating comes in three natural cedar selections including a timeless Weathered Gray, a classic shade of Nantucket Gray and a Cedartone that enhances the look of new cedar. Don’t Entrust Your Cedar Roof’s Cleaning and Preservation to Anyone Else. In the second stage, experienced and skilled technicians operate a high-volume, low-pressure spray unit to evenly and precisely coat the entire cedar roof surface with Amteco’s TWP (Total Wood Preservative) 200, a one-coat penetrating treatment designed specifically for cedar shake and shingle roofs. This protective coating penetrates the cedar shakes and shingles deeply to provide outstanding weather protection, while still allowing the cedar to breath. The coating prevents both cedar shakes and shingles from checking, cupping, curling, splitting and decay while its water repellent blend is guaranteed never to crack or peel. The treatment is approved by the EPA and only needs to be reapplied every five to six years, making preservation a decision that will add value to your home while requiring limited future cedar roof maintenance. Please note: While the product is not technically a cedar sealant, many homeowners incorrectly refer to preservation as sealing a cedar roof. If you truly seal cedar, the wood cannot breathe properly or moderate moisture as it should, so never use a sealant for cedar roofs. It’s re-coat time, repeat your cedar protection and stay In-Cycle. 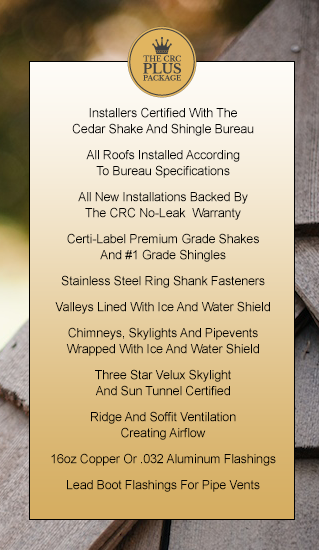 The Cedar Roof Company suggests its customers stay “In Cycle” and not let their cedar roofs weather longer than what the treatment is intended for. Preservation needs to be repeated only once every five to six years depending on your original selection of color. Along with superior roof protection, homeowners who stay “In-Cycle” also enjoy the benefits of The Cedar Roof Company’s Five-Year Limited Leak & Repair Guarantee. This Guarantee protects our preservation clients by assuring a low fixed repair deductible should repair become necessary. Our Re-coat customers also have access to Transferable Warranty Coverage and Roof Certification if they decide to sell their home. An evaluation and estimate for Re-Coat protection. Before an estimate can be submitted for Re-Coat, an evaluation of the roof is required. The different sections of the roof will be examined in its current shape. Any repair work if necessary will be noted at this time. We recommend that you schedule your appointment and plan to be present if at all possible. We guarantee that you will learn more about your shake or shingle roof by viewing it with a professional then what you will read on any proposal. The estimate to follow will be clear and informative including a price for the recommended work. 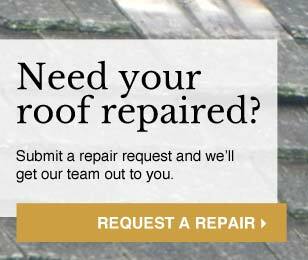 If you think your wood roof might be ready for Re-Coat and you have not heard from us or forgot to respond to a past reminder, please call our office and get the necessary updated information. With so many evaluations to be scheduled and past customers to contact we appreciate your cooperation. Talk to us before you decide to sell your cedar roof home. All Guarantee holders (preservation “In Cycle” customers) can elect Transferable Leak & Repair Warranty coverage for any remaining months/years of their Guarantee term if the decision to enter the home on the real estate market is decided. This is considered an upgrade of coverage. If an upgrade of Transferable Warranty coverage is elected within the Guarantee term an upgrade charge will be applied on a prorated basis to the remaining months/years. We also recommend to all Guarantee/Warranty holders that a Roof Certification be performed and dated at the time the home is offered for sale. The advantage to the cedar roof homeowner when selling the home is enhanced when factual documentation of the condition and life expectancy of the roof was a consideration when determining a fair market price for the home. There is nothing more damaging than an unforeseen report from a home inspector that could have been minimized or avoided altogether. 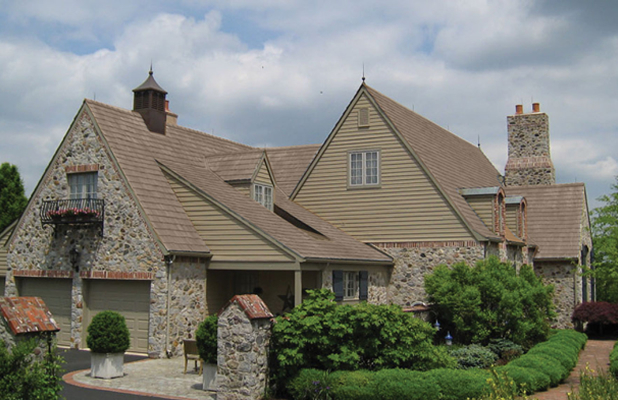 Based in Malvern, Pennsylvania, The Cedar Roof Company provides cedar wood roof installation, repair, maintenance, cleaning and roof certification throughout Chester, Bucks, Montgomery, and Delaware Counties. For information and a free estimate, call us today at: (610) 647-3099.